Hi guys! How was your Labor Day weekend? We spent ours working on some house projects, like repainting the front porch and hanging a new porch swing. Also tried to keep up with what was happening in Texas, which is heartbreaking. You’ve probably found ways to help already, but if not, here’s an organization I’ve been following and supporting. In lighter news, have you seen the recently unveiled HGTV Urban Oasis 2017? This year they’re giving away a Craftsman-style bungalow that got a major makeover in Knoxville, Tennessee. Keep scrolling to see how it looks now! They carried the blue and pink color scheme throughout the house. I know some of you are cringing to see all that original wood painted over. The rooms are not only brighter because they painted the woodwork, but because of the lighter floors. 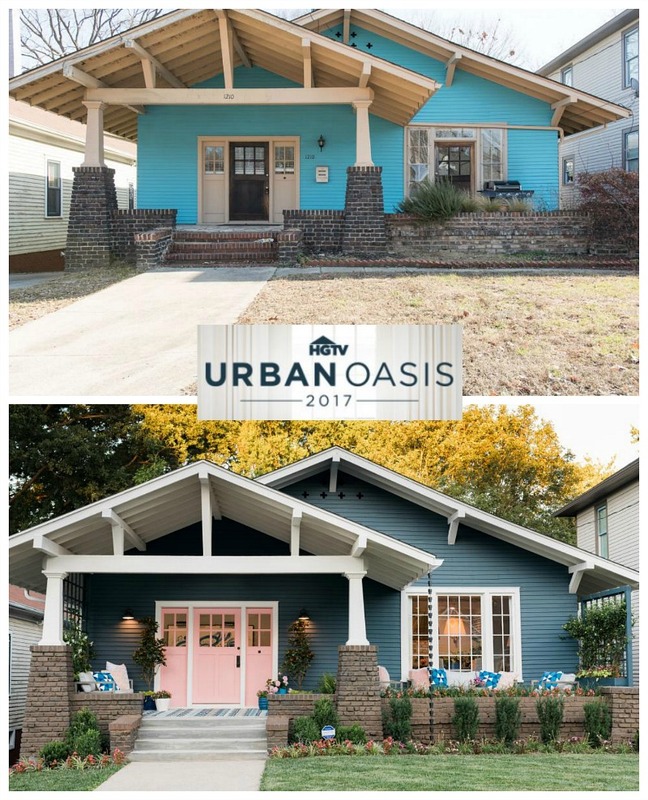 You can register to win this house starting October 2nd over at HGTV’s Urban Oasis 2017 page, where you’ll also find more photos and source information. (Photo credits: Robert Peterson of Rustic White Photography, Sarah Busby, and Tomas Espinoza). Better than their last “update,” bit not by much. In 10 years….I see a homeowner removing paint. Interesting. Interesting. I would have done some things differently. Like NOT PAINT/REMOVE THE ORIGINAL CRAFTSMAN MOLDING!!! The pink door gave me pause in the first shot, but okay, I could live with that. Then I saw the living room. Oh dear. If you don’t want a craftsman house, don’t buy one!!! This is NOT OKAY. Sorry for the rant, but… the whitened floors, the recessed lighting, the weirdly painted brick in front, the whole back of the house… nope. Congratulations, HGTV. You took a house with history and character and made it look like every other designer house. Ugh. I love the lightness and brightness of the house… but I agree with Laura, above… so sad to see a lovely old Craftsman turned into another trendy looking magazine cover… to paint over and remove the character and patina of the beautiful wood is heartbreaking. Why would HGTV even let a designer paint a front door pink, ridiculous! Exactly what I was going to say. If you just want a dry-walled white box, buy one. There are tons out there. There aren’t all that many original-condition houses left. I know!! WHY is this “after” display even featured?? It should be a lesson in what NOT to do. It’s a Craftsman, we are supposed to- well, “should” rather, conserve and care for it’s iconic features, not hide them with ugly, trendy white paint. I think this painting everything the bluish white is simply ghastly, and removes all elegance, placing a home in the realm of the quickly-built lower-middle income suburban tract home. I mean, why bother even having wood if to paint it white, why not just buy a home with nothing but sheetrock interiors? I’m sorry, I am so angry about this, I don’t want to look at this site anymore. This is the second home in the same front page of the Hooked on Houses website with the antique wood all painted. I really cannot stand this anymore. It’s just pathetic. Oh, my goodness, I’m sorry this upset you so much, Kristin! I feature houses that I think are worth talking about, not because they are “perfect examples of what to do.” This one was featured because HGTV is giving it away, and I knew people would have a lot of opinions about it. The other was featured because it was remodeled by a celebrity couple, and I was able to track down the “before” photos that other sites weren’t showing. I knew if I didn’t show the before photos, readers would probably like them better, but that’s what made the stories interesting to me — seeing the things that had been changed in the houses, for better or worse. Agree Laura! Not many people appreciate old houses with their real patina, pokey closets, separate rooms and smaller bathrooms. They say they want old charm and character but what they really want is something new and open concept with designer finishes and big islands in the kitchen… just like most new tract houses. That’s exactly what this one looks like. Booooo… HGTV! I agree – but did it look to you like the “before” house wasn’t entirely untouched? The floors almost looked like laminate, and there were drop ceilings. I’m not sure. Couldn’t have said it better myself, I totally agree. I loved it! I would move in tomorrow and not change a thing. Where does it say that a house has to stay dark and ugly, just because it was built that way. The house still has the good bones – just updated….? I’m with you, Polly!!! I LOVE this makeover!!! It’s a beaut!!! I am saddened that all the lovely wood has been painted. The house had character before and now has none. I do not agree that bungalows are dark AND ugly. They may be darker but certainly not ugly – they have a beauty of their own. Part of what makes a Craftsman a Craftsman is the wood. Painting over it was a travesty. I’m also not keen on the color scheme of pink (I can’t stand pink at all) and blue. I like the kitchen & patio but the Living & Dining room makeovers are a dud. Fortunately, I have a Craftsman that’s almost untouched including the original kitchen cabinets, china cupboard, telephone nook, fold-out ironing board cabinet and claw foot tub. I hope it survives the ever-faster/never-ending/dated-as-soon-as-it’s-installed cycles of HGTV and the internet. Ugliest house ever after a makeover. A classic house ruined. Not a big fan of the inside. I don’t seem to care for this designer. I don’t think I’ve seen a single HGTV house I’ve liked. That Linda woman who used to do all their dream houses was even worse than this guy. not a fan of HGTV decor at all, everything looks toooo staged , do people acually live in HGTV houses ???? julia….. i got ”hooked on houses ”….2 years ago, no more hgtv makeovers on your website …please….. I didn’t cringe when I saw the painted oved wood, but I did cringe when I saw they installed the oven right next to the fridge. In 2017. Energy efficiency anyone? Oh, and that beautiful rug right by the entrance? Not very smart IMHO. Other than that, I liked the house a lot. The kitchen is my favorite. The kitchen is most odd. The sink and hob are unfortunately next to each other and the fridge is somewhere that’s else. The cook will have to trek around that big island to reach the fridge multiple times to prepare a meal. Some very peculiar choices were made. I didn’t even notice the sink next to the stove. Wow. Not very smart. As a passionate cook, I think especially in the kitchen functionality must be regarded first, and design second. Everyone wants a nice kitchen, but I always cringe when in a new kitchen such crude design “errors” are made. When I said the kitchen was my favorite I was referring to color scheme and style of cabinets. I am not a fan of painting over woodwork, but I will not condemn a house on that fact alone. However, those light floors seem better suited to a beach house, not a craftsman home in Tennessee. A darker floor would have balanced the painted woodwork better in my opinion. The kitchen and the back of the house are my favorites. My least favorite? The pink door! I love color as much as the next person (probably more), but that pink is awful. The color scheme inside. Pink and blue? Is the 1990’s coming back? I do like the black and blush room a lot. To me, the colors are all over the place. Typical of HGTV to paint the original wood, white. Where is Nicole Curtis when you need her? One of the wonderful things about woodwork is that it can be stained or painted, according to the tastes of the homeowner. I actually prefer painted woodwork myself, but if I’d had HGTV’s budget I likely would have chosen simply to refinish the wood in this house rather than painting over it. Still, the lovely style of the woodwork shines through for the most part. What doesn’t make any sense to me is the pink front door. Even if pink is a homeowner’s favorite color, I don’t think pink looks at all inviting on the front door of this style of house. Some things just don’t seem to fit, I think. I do think it was a good choice to paint the sidelights to match the front door. If I were to win the house, I’d just re-paint the front door pronto! How does the woodwork shine through when it’s painted? It might as well be MDF. Not trying to be argumentative, but it doesn’t make sense to me. Also, painted woodwork just looks cheap to me…like they’re hiding very low grade wood. This is not as much a travesty as the one they re-did in Asheville. But still. I’m with the others here about painting the woodwork and the light floors. Of course the kitchen is a vast improvement, and I like the bedroom with the dark gray trim. The ceilings needed to be replaced and were. I love the hall wallpaper and since the trim here was already painted, I like the way they treated this area (except the light floors, which I agree look beachy). In general, they did save more of the Craftsman elements than the last Urban Oasis, so an improvement. I love a peachy pink door on a white London townhouse, but not on an American Craftsman, though with that color siding and white trim, I’m not sure what color I’d paint the door and surround if they couldn’t be stained. I agree with all the comments about the pink door. In the 50s pink and black were hot colors. Not so much anymore. The house does look refreshed but I personally have a hard time painting over roughsawn oak . If the wood was in bad shaped I would understand. I actually love the exterior the best. LOVE that blue and white, and actually really like the pink door. I find that the front door is one of the easiest things to change out with color. In a few years it would give a whole new look to repaint the door and side lights. How about a little FUN in a door? As for the interior, I can live with the painted wood, it really still has character. I cannot figure out what they did in the kitchen? Looks like a completely turned around plan, wish there was a diagram, door is gone, what is that brick wall, was it added and why? Not a fan of no upper cabinets, that is a true minimalist, and possibly someone who does not cook! Can’t say that the dark grey paint in the BR is an improvement, makes the room seems small to me. But bravo for the new screened in porch upstairs and making the lower patio a usable and pleasant space. I also think that a more traditional wood flooring of douglas fir kept to a natural color and sealed would feel warmer, but if it was a choice of taking out one pergo for another then the bleached wood certainly lightens it up. Always enjoy your bungalow posts. Keep ’em coming! Well. Based in some of the comments, everyone has their opinion. But I for one LOVE this little bungalow house. Very unique and love everything about it. I even love the pink doors, but probably down the line I would change the color. The living room seems very small. Wish there was a floor plan of the final project to see. Not especially liking the more modern furniture included (but love the bedroom and kitchen and bath). I would have made the living room eating area a little more country French decor/furniture. Overall though I love it. I personally don’t like the darkness that stained wood brings to a house. I like the lightness of white trim. That said, I would not buy a house that I knew I would paint that had beautiful, old, original, unpainted wood. I had a house with chestnut trim that I moved from rather than cover it. You cannot get chestnut anymore. Even if you don’t like it, you need to respect the age and beauty of a house, not destroy it. And I’m so over this modern decor. Doesn’t HGTV pay attention to its own audience? Hello Joanna! There is a special place in he !! for designers that paint near century old wood work. It involves painted rococo carvings and a dental pick. Oh and sanding Fumed Oak…doesn’t work. The process of fuming penetrates the wood in an irregular way, sometimes quite deep. That pink door is an abomination and the perpetrator should be punished in the old way for sins against good taste. Whew! This one really got people talking, Julia! I actually like this makeover. It did make me a bit sad to see the woodwork painted, but it’s fresh and contemporary. I love what’s been done to the exterior. I would love to have one outdoor space like this, much less 3! I love the painted woodwork and blue and white birch tree wallpaper. Can you tell me who makes the wallpaper? While it looks beautiful, it’s completely wrong for that house. You don’t do contemporary cottage in an Arts & Crafts Craftsman. It’s like decorating a 1920s Spanish Colonial in Midcentury Modern or a Midcentury Modern decorated in ornate Louis XV. The tile on the screened-porch fireplace has me DROOLING! Looks like a quilt! I could not love it more if I tried. Elise, I am swooning also. It’s my favorite part of the house! I absolutely love the front and back exteriors! However, I have a problem with the woodwork being painted white. I had a traditional bungalow as well as a larger 1920’s home and only the upstairs had painted woodwork. I, too, am a traditionalist. That poor house 🙁 Such a shame what they did to it. I don’t have anything nice to say so I’ll stop there. Soooo, I am ok with the makeover, not my taste, but ok. However…the pink furry pillows carried throughout is downright forced. We just bought land in Knoxville and I promise you, this is nowhere near the norm. Maybe for a group of sorority girls not living in their house?! This is clearly not representative of southern charm, especially in a city that bleeds orange and white. And, as a former sorority girl I don’t think I could stomach the teal and faux trendiness. I LOVE your blog. Thank you for showing us everything!! !